You can post your link in our comments link so we can have a look or you can email it to us at daringcardmakers@hotmail.co.uk. Its my turn (Bondgirl) to set the dare this week and its inspired by my life. As you all know I have 2 small children (2 and 4 months!) and managing life with them, my housewifely duties, studying for my BA, life, etc etc etc crafting sometimes has to take a back seat. You know what its like for every item you cross off your to do list, another 2 get written on. And then comes the dilemma, its X's birthday, or A and B's anniversary - what do you do? Time isnt on your side to make a card but you dont want to pay a small fortune for one in the shops either. Well hopefully this dare will help you out. I want you to make a QUICK CARD! a card that takes you no more than hmm say 30 minutes max to do - start to finish. No set ingredients and pick your own theme, but be quick and be crafty! (and dont forget to tell us how long it took too). You can post your link in our comments link so we can have alook or you can email it to us at daringcardmakers@hotmail.co.uk. And its for 10 years. Hmmm which would you choose? Hope you will find the theme inspiring! 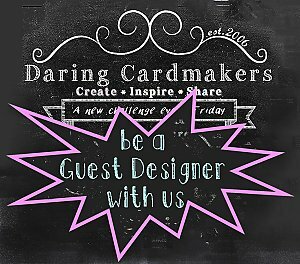 Hi Daring Card Makers All, Kathy here to set the dare this week - but first - a Big Thank You to all who've joined in with Jane's Use a Quote Dare, and the Midweek Extra too. your cards are fantastic and the ideas you share with us all are always inspiring. Even if we don't always manage to leave a message, we do visit your blogs to see your cards whenever you leave a link on here. ....no, not actually made with wheels, you can still use card and paper ;-), so you don't need to go and steal the ones from the car or the kids' bikes and write a message on them! Anyway, I'm sure you can get your creative cogs moving and come up with loads of inventive and different ways to get a wheel or two into your cards. Hope you enjoy playing with this one. The Team has come up with some ideas to get you thinking but we're look forward to seeing what you do with it too so please leave a message and a link so we can come and see your Wheely Wonderful cards. This is the 7th in our series of Anniversary themed cards and we are looking at the 13th Anniversary gifts of Lace or Textiles/furs! So very touchy feely for this weeks little extra - have some fun. Here are some from the Design Team to get you started! Hi All, it's Keryn here launching Jane's Dare this week. Jane has temporarily, I hope, lost her access to the internet. Thankyou to everyone who joined in Tanya Leighs shapes dare and the mid week little extra. We always enjoy admiring your hard work. This week we'd like to introduce our new Guest Designer - Jozza. This is her first dare and a fantastic job she's done too. Jozza will be with us for the month of June. Jane this week has dared us all to include a quote on our card. Stamped, Computer Generated or Rub Ons it doesn't matter and choose your own style or occassion. Don't forget to leave us a comment and your blog link and we'll come on over to check them out. Keep scrolling down to see the gorgeous cards created by the design team. It is so great to see all those cards "shaping up" this week. Keep them coming in! We are on our 6th in the series of challenges inspired by Wedding Anniversary themes - how time flies. Don't forget to leave us a comment and a link to your blog so that we can come visit ! Thanks again for joining in.